JNN 13 Nov 2014 Manama : Anti-regime protests continue in Bahrain as people take to the streets in various parts of the Persian Gulf kingdom. Violence broke out on Wednesday as Bahraini security forces clashed with protesters during the largest rally that took place in the northwestern village of Bani Jamra. 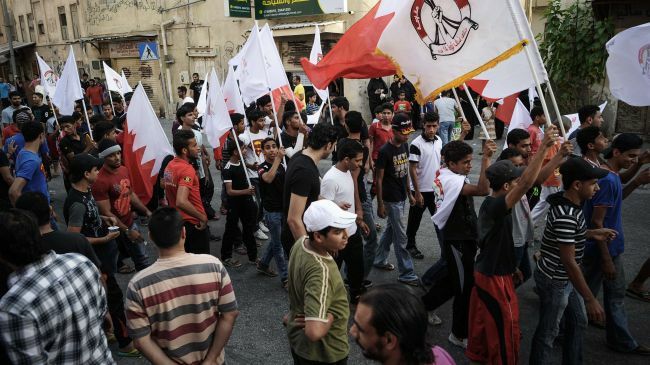 According to reports, people also protested the regime’s policies in the al-Shakhoura and Sufala villages. The protesters called for the ousting of the Al Khalifah regime and demanded a referendum be held on the country’s political future. Bahrain has been criticized by human rights groups for its harsh crackdown on anti-government protesters since the country’s uprising began in February 2011. This entry was posted in Middle East and tagged Al Khalifa, al khalifah, Anti Regime, Bahrain, peaceful protesters, Protesters, Shia Majority. Bookmark the permalink.